If you’ve searched for dedicated cappuccino machines and have had a hard time finding one, it might be because you’re looking for the wrong thing. This is because of what a cappuccino is. Once you understand how the beverage is made, you’ll have a better understanding of what type of machine you need to buy. Don’t worry, though, because we’ll provide you with all the information you need, including what to look for in a cappuccino maker and the top machines on the market that will help you make a great cappuccino. This stylish cappuccino maker is definitely a showstopper thanks to its classic design and bright red color. You can see it from a mile away but it really is a very attractive unit. It also combines the best of both worlds in that you can use pods to brew the espresso — or any other beverage of choice — and use the wand to steam and froth the milk separately, giving you an additional level of control. It features six different cup sizes, a 44 fl oz removable water tank, as well as a receptacle for 14 used capsules, which will save you quite a bit of time. It also includes a folding drip tray that will allow you to use both short and tall cups as well as a power saving function that will switch the machine off automatically. The black and silver color scheme of the DeLonghi Magnifica S Black Smart Automatic Cappuccino Machine screams class, along with the sleek design of the unit. It’s a robust machine that will stand the test of time and its compact size makes it ideal for any size kitchen. It features a rotary and push-button control panel that’s easy to use. This cappuccino maker also features thermoblock technology, which ensures that the brewing temperature is perfect every time. This technology, when coupled with the energy saving switch, also makes this unit extremely environmentally friendly as it conserved up to 77% of energy. The rapid cappuccino system also ensures there won’t be any downtime between making the espresso and drinking a creamy, flavorful cappuccino. This unit features a removable 60 fl oz water tank, a removable receptacle for used coffee and a removable drip tray. It also comes with a decalcification indicator, a bean container designed to save the flavor of your coffee and even a free set of six Italian-style espresso shot glasses. The Saeco Philips Intelia Deluxe Espresso Machine features a relatively simple design with a brushed silver and black finish. However, it comes with a wide range of features that make it a great cappuccino maker for even the most discerning tastes. Thus, this unit features a removable brewing group, which, along with the automatic rinse cycle, makes cleaning and maintenance as simple as you can imagine. It features a ceramic coffee grinder with various options in terms of size. It also has an automatic system to tamp the ground coffee and eliminate used grounds into a special receptacle, which is extremely convenient. The milk frothing system is also incredibly easy to use. Simply attach the milk container to the machine and it will do the rest, including adding the milk to the coffee. You’ll enjoy a delectable, creamy and wonderful cappuccino every time. 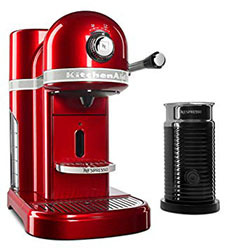 The Nespresso VertuoLine Coffee and Espresso Maker offers simple, one-touch brewing. Simply insert the capsule and hit the button to enjoy a tasty, delicious cup of espresso. The machine automatically ejects the capsule after the coffee has been brewed and only needs between 15 and 20 seconds to pre-heat. It also features an adjustable cup support with three different positions for different sizes of cups. The nespresso machine itself can be used to make 8 fl oz of coffee and 1.35 fl oz of espresso. It uses large and small capsules to make coffee and espresso respectively. This unit features the company’s patented Centrifusion technology, which delivers an amazingly tasty cup of coffee every time. Thus, the capsule is spun at up to 7,000 RPM, which blends the water with the ground coffee to create the ideal crema and ensure an excellent tasting cup of coffee or espresso every time. It also comes with a special smart system that can automatically recognize every Grand Cru blend thanks to the barcode featured on the rim of the capsule, making life even more convenient. You don’t have to change any settings. Simply press the button and the machine will know what to do. The Aeroccino is a separate unit that creates milk froth for your drinks. You can make it hot or cold but will always get a fine, smooth texture. This unit can also be used just to heat milk. It’s extremely silent and fast. Simply prepare your milk froth and pour it over your espresso for a stunningly tasty and amazingly creamy cappuccino. The Gourmia GCM5500 features a sleek design with a shiny black finish. It allows you to make an excellent cappuccino by just pushing a single button as the espresso machine features an inbuilt milk frother. The two work together to create a stunning, flavorful and incredibly creamy cappuccino or delicious latte. Another advantage this unit presents is that it is compatible with practically all Nespresso pods. In other words, you can make any type of espresso you want, but also a wide range of other beverages. It also features a set of controls and a LED display that is easy to read, which allow you to create various styles of espresso. It features a removable water tank, as well as a removable drip tray and great, which make cleaning the unit incredibly easy. This way, you won’t be spending so much time on cleanup, allowing you to spend more time enjoying your cappuccino. It also comes with a cup platform with two positions for shorter and taller cups and a used capsule receptacle. This unit is on the lower end of the price range compared to others of its kind, but it offers a great range of features and has the capacity to create an amazing cappuccino, making it an excellent option for someone who enjoys a great cup of gourmet coffee but is on a limited budget. The secret to a great cappuccino starts with a perfect cup of espresso topped by just the right of hot, properly frothed milk. 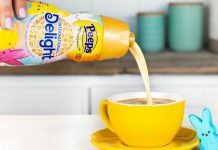 For the more adventurous, a shot of flavored syrup in the coffee and a dash of chocolate or cinammon on top can elevate your cappuccino to entirely new levels. But to achieve this perfection, you need the right cappuccino maker. Luckily, you can’t go wrong with any of the aforementioned cappuccino machines. Every unit will deliver a stunning, tasty cappuccino and will save you a ton of money when you stop buying expensive cappuccinos from gourmet coffee shops. How Is a Cappuccino Made? A cappuccino consists of espresso and milk that has been turned into a microfoam. Generally speaking, a cappuccino has a milk to coffee ratio that is equal, where the milk foam is poured on top of the espresso. In a latte, the milk to coffee ratio is two to one and the espresso is poured into the milk. The secret to cappuccino is a great espresso but also how the milk microfoam is created. This microfoam is created by forcing hot air into the milk, which gets caught between the protein molecules creating a voluminous foam. The higher the protein content of the milk, the foamier the result, which is why skim milk will generally produce a foam with a larger level of volume. The milk foam is usually made by using a steam wand on an espresso machine, but you can also get various other gadgets nowadays to create the milk froth separately. Note that with a cappuccino, cinnamon and/or powdered or shaved chocolate are often sprinkled on top. So, the conclusion is that you need an espresso machine with a steam wand or an espresso machine and a special milk frother. Since we like convenience as well as saving space and money, we’ll be looking at all-in-one units that make the coffee and froth the milk. Like with any type of appliance, there are certain factors you need to consider when purchasing a cappuccino maker. The first thing you need to consider is whether you want a pod machine or a traditional cappuccino machine. With a pod unit, all you have to do is pop the pod into the unit and a few minutes later, you’ll have a perfectly delicious cappuccino waiting for you. With a traditional unit, you’ll have to put in a little more effort as you’ll have to steam and froth the milk yourself and pour it over the espresso once it’s ready, so it will likely also take a little longer. If you’re a stickler for tradition and like having a greater level of control over your cappuccino, then a traditional unit is definitely the way to go. However, if you don’t want to deal with the hassle and also want access to a wide range of beverages, then a pod-based cappuccino maker is probably a good bet for you. 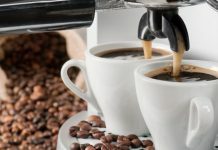 Note that there are also units that steam and froth the milk automatically and add it to the coffee, but they are also limited in beverage choices. How Long Does It Take to Make a Cappuccino? Another consideration is how long it takes to make a cappuccino. A good machine will have a piping hot espresso ready in less than a minute, and you can expect it to take another minute for the milk to be ready. Depending on the unit you buy, though, it can take a while for you to add the coffee grounds, tamp them down, fill the water tank and froth the milk. It will certainly take longer than using a pod machine, but some feel that the quality of a cappuccino from a pod will never measure up to one made from fresh coffee. There are, essentially, three options in terms of water supply. The first is a removable water tank, which is incredibly convenient because it makes filling the tank much easier. Other units have fixed tanks, which are, obviously, not quite as convenient. The final option is one where you connect the machine directly to your home’s water supply. This last one is probably the most convenient, but it will certainly increase the price of the cappuccino machine. You will definitely need a milk frother if you want to make a cappuccino. 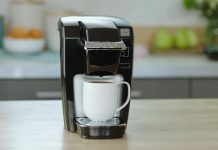 Some units come with a system whereby the milk is automatically steamed, frothed and added to the coffee right after brewing, which is probably the most convenient option. Other designs come with a steam wand and a separate cup or jug, allowing you to froth the milk yourself. Clearly, the automatic option is more convenient but will also be more expensive.